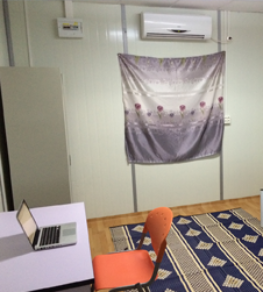 The Swedish aerospace & defense company asked Source Supply to supply and construct accommodation facilities, offices, a secure bunker and recreational facilities for their site at Mogadishu airport in Somalia. First Objective – The immediate project to supply and construct 3 custom-designed offices and 4 en-suite accommodation containers. Second Objective – To supply and erect accommodation, administration offices, a bunker and recreational facilities several months after the initial project. 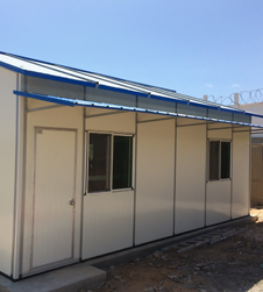 Source Supply decided the best option was to design and manufacture the prefabricated offices and accommodation units in Dubai and then airfreight direct to Mogadishu from the UAE. The total weight for the initial project with all the fixtures and fittings including furniture for shipping was over 20 tonnes and this prompted the decision to use a chartered plane. The goods were manufactured and air freighted by an Illusion aircraft within 4 weeks. A team on the ground had prepared the site for construction in advance which enabled the buildings to be erected immediately upon arrival. The initial project was completed. 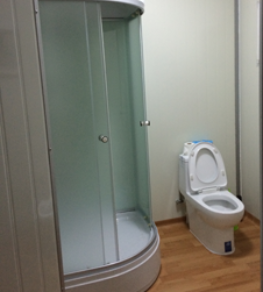 The second objective was the larger of the two and Source Supply arranged the manufacture of the bespoke designed en-suite dormitories, offices, flat pack containers and container bunker in China. Source Supply’s local team worked with a number of suppliers to procure and consolidate the furniture, air conditioners, catering equipment, solar heaters, TV’s and gym equipment. 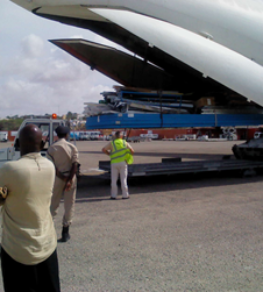 All items were packed including the buildings into containers, tagged and then shipped to Mogadishu where the construction team assembled and constructed the camp.